Get your picture taken on stage sitting on a motorbike. Rangers will be held at Nellies Bunker at the Sportsman Hotel, doors open from 8pm. Hot Music and hot shows. The Dungeon will be open again. Stage shows , members draw and lots more. So come and have a great night with your Bootco Brothers. DJ Master Sergeant will be making you sweat on his dance floor. Also BootCo. Encourages all members and guests to take the time tio fill out the QuAC survey that will be available at Rangers. Even though the dust from Corium has finally settled, don’t pack away your leather gear away too soon. 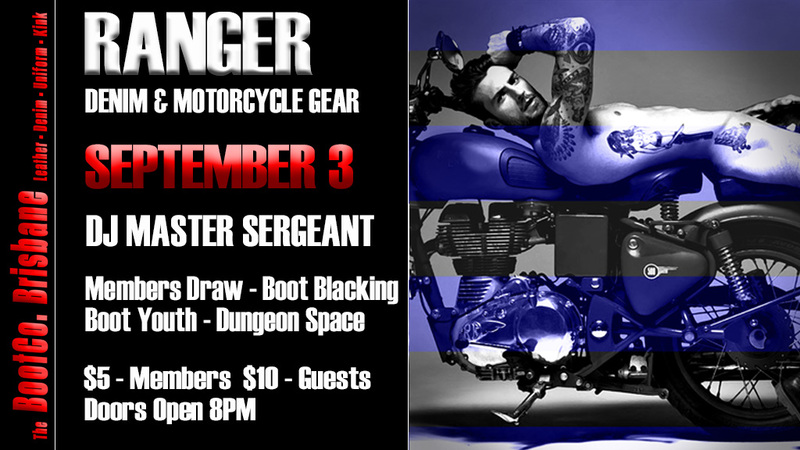 This weekend, BootCo’s monthly pub night will celebrate blokes on in bombers on their bikes in a special tribute to the Rangers Motor Club. DJ Master Sergeant will be on the decks, there’ll be plenty of blokes and beers, and there will even be a bike to grab a photo with. The Rangers MC was established in 1980 as a social venture for Gay men who enjoyed life in the great outdoors. For 30 years the club organised regular runs and gatherings in the Southeast Queensland and Northern NSW regions, as well as joining larger meets with affiliated groups around Australia and abroad. Some of these groups included the South Pacific Motor Club, the Dolphin Motor Club, which had a chapter in Brisbane for a period of time, The Griffin Motor Club, the Jackaroos, the Southern Isle Motor Club and the Southern Region Motor Club. The Rangers are closely connected to BootCo and Brisbears; some of our community elders fondly remember the activities that the Rangers organised. BootCo’s annual award for community excellence is named after Noel Lewington, who aside from his enthusiastic support of our club, amassed an extraordinary archive of motor club ephemera and memorabilia (including a number of Rangers pieces), which is today held in the collection of the Australian Lesbian and Gay Archive. BootCo has recently become custodian to several other unique pieces of Rangers history, formerly in the safe care of life member Frank Croucher. These days, all traditional LGBTIQ+ Motor Clubs across Australia are extinct, however other organisations have now emerged in their wake, including Brisbane Gay Bikers, which arranges regular runs from Brisbane, and BootCo supporter Camp It, which hosts a few amazing male-only camping weekends annually in the South-East corner of Queensland. Come along this weekend to join in the fun, and wear your leather, denim or uniform with pride.